Sorry I have been absent for the past week or so. Every time I sit down to blog something happens. But finally tonight I have had a chance to sit and chat with you. I have received my angel parcel but have been unable to thank my angel as they left no name or e-mail address. So if you are reading this little angel. Thanks so much for my goodies. 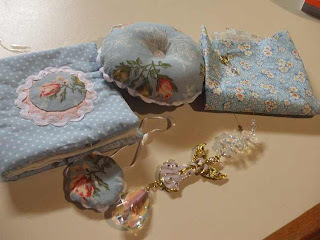 I received a little matching scissor fob, needle book and pin cushion plus a lovely fat quarter and a gorgeous little angel to hang (Which is now hanging over my bed). Thankyou whoever you are. My parcel hasn't arrived yet so I am not able to show you what I have sent. Talking about angels. 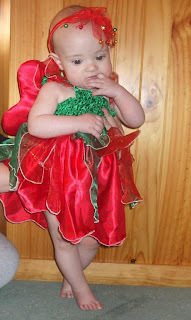 Look at Maddie dressed up as a little christmas angel. She is 8 months old now and even though she is still really tiny she is doing so well for a premmie. I have also made a pot of Strawberry Jam - YUMMMM !!! 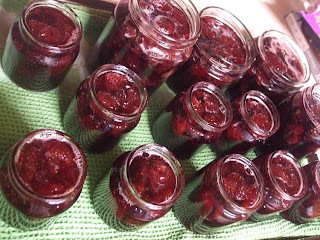 The gifts you received are just fantastic and the jam looks good! my you have been rather busy. And Maddie looks so delicious!!! Isn't she growing so fast, she will be a delight at Christmas time I am sure. Strawberry jam - YUM! Oh Fee Fee she's absolutely completely adorable ... just like a little gumnut blossom he he he. Bless!!! Aren't you fabulous making all that jam - Yummmm!!! 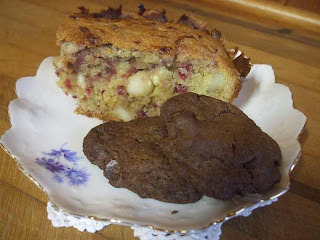 And I'd LOVE the recipe for those raspberry and macadamia blondies!! They look delish :o)!! Gorgeous gifties from your 'Angel' too ... what a shame she's still a secret though. You have been a busy, busy bee. It's a wonder you get anything done with an angel like that one hanging around. I've made those blondies before and no they don't last long do they? I'll have to come over for morning tea one day, those sweets look delicious! What a lovely gift you recieved, Fiona! But look at Maddie - what a lovely picture she makes!!! She looks so darling all dressed up like an angel. She is a beauty! Remind me to drop over for tea. Oh my those are some yummy-looking treats! YUM YUM YUM!!! I made some strawberry jam a couple of months ago when strawberries were extra cheap after a bout of hot weather and it was so delicious!!! It's all gone now, great on pancakes, crumpets, pikelets etc. and of course it must have thick cream on it too. 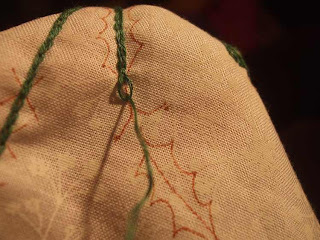 I am enjoying the Gum Tree Designers free projects, not many more to go now Fiona. Your little angel is just so cute!!! What a lovely angel gift Fiona. And the adorable Maddie, well one doesnt need to say anything really, she is a stunner and such a beautiful wee poppett. OMG! What an adorable angel!